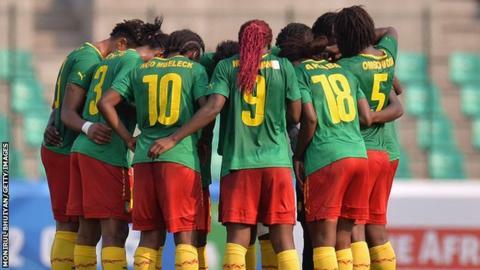 Cameroon were forced to fight back from a goal down to beat Zimbabwe 2-1 in the first leg of the final women's football Olympic qualifier in Yaounde. In the other qualifying match in Johannesburg, South Africa were held 0-0 at home by Equatorial Guinea. Madeleine Ngono Mani scored both of Cameroon's goals in the second half to give the hosts a slender first leg advantage. Zimbabwe stunned the hosts early on by taking the lead through Rudo Neshamba. The Cameroonians reached the second round at the Fifa Women's World Cup in Canada in June on their debut, losing to China. However, Zimbabwe will have a precious away goal when they host the second leg in Harare in two weeks time. In Johannesburg, Banyana Banyana and Equatorial Guinea played out a goalless draw at Makhulong Stadium in Tembisa. The hosts created the best chances but failed to convert any. The two teams meet again on Sunday 18 October at Estadio de Bata in Malabo. Two teams will represent Africa at the 2016 Rio Olympics.